Mewah Group is an integrated agri-business focused on edible oils and fats. One of the largest palm oil processors in the world by capacity, Mewah produces a wide range of refined and fractionated vegetable oils and fats principally from palm oil. It also produces oils and fats from lauric oils, such as palm kernel oil and coconut oil; and from soft oils, such as soybean oil, canola oil, sunflower seed oil and corn oil. Featuring integrated operations throughout the edible oils and fats value chain, from sourcing and processing of raw materials to packing, branding, merchandising, shipping and distribution of the products, Mewah’s products are sold to customers in more than 100 countries, duly supported by its wide range of brands including long established and well recognized Oki and Moi brands. Mewah strives to be a global consumer products business by expanding range of consumer products, offering specialised applications and customer solutions while consolidating its position in oils and fats business. To support its strategic vision and growth plans, after remaining privately controlled business for over 50 years, Mewah went public in 2010 and got listed on the mainboard of the Singapore Exchange Securities Trading Limited. Since going public, Mewah has invested in a new palm-oil refinery, a palm-oil based dairy manufacturing facility and a biodiesel plant in Malaysia. It has also added rice, dairy and palm-based soap to its product portfolio. 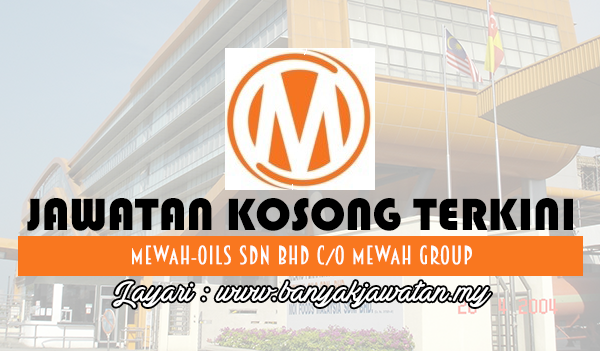 0 Response to "Jawatan Kosong di Mewah-Oils Sdn Bhd c/o Mewah Group - 29 October 2017"